Capital Disc Jockeys ROCKIN' your next event! What type of school event are you having? Capital DJs entertains everything from Homecomings, Proms, after prom parties, snowball dances, theme dances, formal & semi-formals, Banquets, Sweet 16, Graduation parties, Class reunions, College Events, Greek Parties, Fundraisers and more! Our great DJ’s playing clean music and we have an awesome light effects! Our MCs know how get the kids involved with our interactive style with optional great contests and games! We also offer the very BEST in elegant up lighting and our Famous Open Air Photo booths, which fits up to 15 people! How much do you charge? Several factors will determine price. ie: Your venue, date, time, number of guests, options needed. Once we have all of this, we’ll be happy to offer a very fair quote. I just wanted to thank you again Tim so very much for a wonderful evening. You do such a great job with these kids, and the adults were happy, too! (Nothing spells success like the chaperons doing the macarena) Can’t wait till the spring social!! 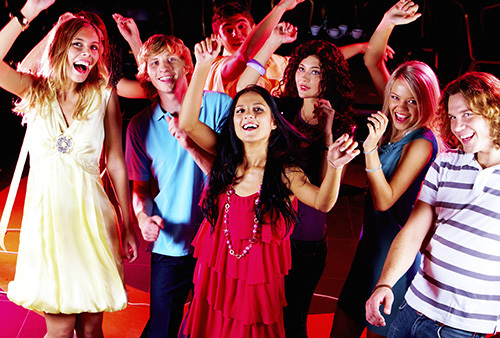 Chances are that you’ve never hired a DJ for a school dance. We’ve assembled a list of most frequently asked questions to help you make a better education decision. Let’s get the most popular question out of the way! Up to 3 hours of non-stop entertainment! Our Signature package for Schools! Up to 4 hours of DJ AND Photobooth! Open Air Photo booth, up to 4 hours! This includes 2 Photo booth attendants, backdrop of school color, unlimited 2x8 pics custom with your school name and date. Voted #1 In the “Best of” DJ Category According to the Saratoga Today Newspapers 2013! Capital DJs is available for all school functions. Book us to your Homecoming, Semi-Formals, Winter Galas and Prom and More! We are the BEST in the Capital Region! We will give you more value for your dollar.